Created by lava and pyroclastic flows from ancient erupting volcanoes, Trout Peak stands as the jewel of the North Absarokas, the highest peak in the range. Yet the mountain isn't even visible from downtown Cody, and there are no massive crowds scrambling its slopes trying to earn bragging rights. Perhaps that's because it's located in the heart of grizzly habitat and takes quite the effort to get there, with killer long approaches. Trout Peak is massive, covering 16 square miles. The north and southern flanks are long, grassy slopes but the east and west sides are sheer walls of eroding and brittle rock. Bagging this summit isn’t a walk in the park, but people have been climbing Trout Peak for centuries. The mountain lies in the center of several ancient Indian routes, including the Bannock Trail from Idaho east to the bison hunting grounds on the plains and the Meeteetse Trail from central Wyoming up to civilization in Montana. Tribes including the Blackfeet, Crow, Bannock, Shoshone, and Arapahoe all knew the area and undoubtedly ascended many of the peaks. 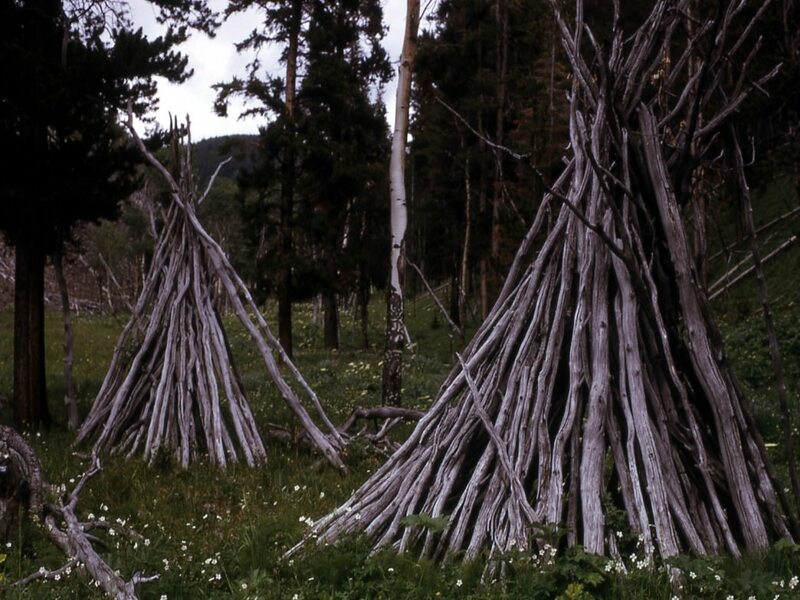 These early travelers left behind artifacts like obsidian points, wikiups (temporary shelters made of branches), tipi rings, and rutted trails gouged by countless horse hooves, some of which are still visible today. On the heels of the Indians came the first European Americans, including explorer John Colter, who, after leaving the Lewis and Clark expedition, traveled through the Cody area in 1808. Jedidiah Smith, William Sublette, and Osborne Russell braved the heart of the Absarokas searching for beaver. After the decimation of the beaver population, prospectors came looking for another type of wealth: Gold was discovered in Cooke City, Montana in 1870 and scores of men fled the played out Montana gold fields for new finds in the Absaroka Range. But the finds were never made and the region remained wild. An odd group of peak baggers came next. Determined geologists seeking to understand the complexities of the Yellowstone region hiked every watershed and climbed nearly every peak within a 100-mile radius of the park. Geologists Arnold Hague and Thomas Jagger summited Trout Peak on August 24, 1893. Some theories suggest that the pair might have christened the mountain after subsisting on nothing but trout for six weeks before their climb. Three years later, Frank Tweedy reached the top and placed Trout Peak on his topographic map of 1896. 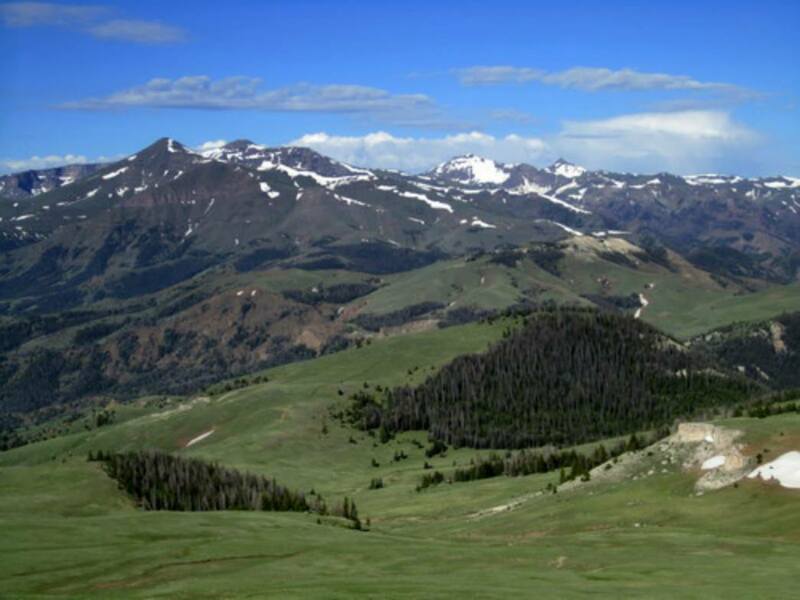 Today there are three routes to the top of Trout Peak, and all involve lengthy approaches. From the south, off the North Fork Highway 18 miles west of Cody, the Jim Creek route travels 12 miles one way with 6,300 feet of elevation. If you don’t have a 4WD vehicle, you’ll add an extra mile or so to the hike. The Spout Springs trail from the northeast is also 12 miles but only has a 4,000-foot gain. Take Highway 120 north eight miles to the Monument Hill Road (County Road 7UH). The trailhead is 18 miles farther on dirt road. The higher you go, the worse the road gets. Keep in mind that Monument Hill Road closes from the end of December until sometime in the late spring. When it’s open, a high-clearance vehicle comes in handy, and depending on the road condition, you might want a 4WD. The third access is from the Dead Indian Campground off the Chief Joseph Highway. Travel north for 17 miles on Highway 120 then turn left on the Chief Joseph. The campground is on the far side of the pass at the bottom of the switchbacks. This is the most difficult route, with an approach of 21 miles and a gain of 6,200 feet. There aren’t many adventurers who can claim summiting Trout Peak. Unless you’re willing to hike 25 miles in a day, the climb requires an overnight with a good possibility of some nosy bruins dropping by. But if you have the skills and knowledge, it’s well worth the effort, and the notch on your hiking poles.